This brief post will provide further evidence that Sanders is leading the total primary vote. It is based on the historical fact that approval ratings are highly correlated to national pre-election polls, exit polls and vote shares. Clinton is leading by approximately 3 million votes (56-44%). But she has a 42% favorability rating. It is highly anomalous and counter-intuitive when compared to Sanders 49% rating. Clinton’s declining ratings are a source of worry for the DNC. Current polls show that Sanders does better than Clinton against Trump. The strong correlation of ratings and vote shares indicates Sanders is leading the True Vote by an estimated 1.7 million margin (53.5-46.5%). View Sanders’ favorable/unfavorable ratings. Sanders exit poll share exceeded his recorded share in 24 of the 26 primaries exit polled. The probability is 1 in 190,000. The difference between his exit poll share and recorded share exceeded the margin of error in 11 primaries. The probability is 1 in 77 billion. Sanders won 13 of 14 caucuses with an average 65.4% vote share and 9 of 36 primaries with a 43.9% average share. The probability of the 21.5% difference occurring by chance is 2.27% (the probability of election fraud is 97.73%). 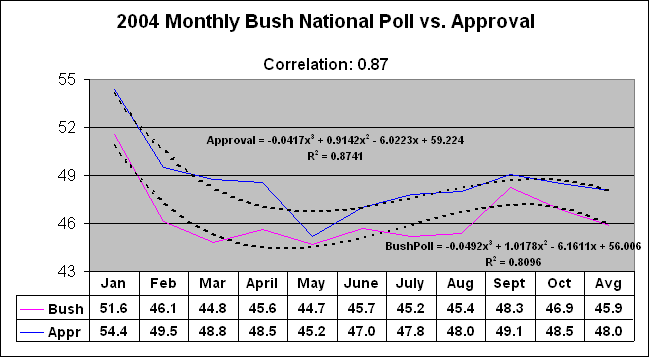 In the 2004 election, the Bush approval rating trend was highly correlated (0.87) to his monthly pre-election polls. The UNADJUSTED STATE EXIT POLLS tracked closely to the STATE APPROVAL RATINGS. There was a near-perfect 0.99 CORRELATION between the polls and approval ratings. Arizona 2016 is the latest poster child of election fraud, along with Florida 2000 and Ohio 2004. Sanders won Utah (a bordering state)and Idaho primaries with nearly 80% of the vote. But he lost in Arizona by 60-38%. Who believes it? The National Exit Pool of six major media conglomerates funds exit pollster Edison Research. The NEP decided not to poll AZ. It’s as if they knew they would have to match the unadjusted poll to a bogus recorded vote; the massive discrepancies would be too obvious. But the networks called it for Hillary with less than 1% of the votes in. How did they know this if they did not exit poll? Luckily the Yavapai County Daily Courier did an exit poll – and Bernie led by 63-37%. Hillary won the county by 54-43%- an impossible 37% difference in margin. But the evidence of fraud goes much further than this one poll. Approximately 70% of voters were turned away because they were registered independents – and Bernie has won a solid majority of them. 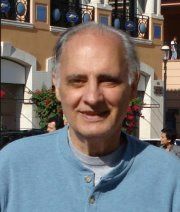 John Brakey is an AZ election activist who has proven fraud. Brakey developed a spreadsheet on the primary. Sanders had 60% in the precincts, but Clinton had 60% in Vote by Mail (VBM) which comprised nearly 80% of the total vote. At 8pm HRC led VBM by 61.5-36.1% of 114,286 votes.Sanders led the 32,959 precinct votes by 60.3-38.8%. The voting machines used were the AVC Edge (DRE); Optech Insight (Optiscan); Optech 400C (Optiscan). Voters had to stand stand on line to vote and are angry that the primary has been called for Hillary Clinton. The majority of Bernie Sanders’ voters have not been allowed to vote. Approximately 1.3 million voters who reportedly would have voted for Sanders were disenfranchised. The Arizona Republic reported that Maricopa County reduced the number of polling places from more than 200 in the 2012 presidential election to 60. Arizona law effectively disenfranchises 36 percent of registered voters. Registered Democrats who had voted in primaries before were told that they were not on the Democratic voting lists . Others who switched their party were told they were not on the list – but could vote on a provisional ballot. The fraudsters apparent goal: suppress voting on election day and rely on Clinton’s large lead among early voters to secure a win by reducing the number of polling locations. At 2:45 AM ET, Sanders was leading Clinton in Election Day voting in Arizona 50.2% to 49.8%, with just under 75,000 votes (about 17.3% of all Election Day votes) counted. The media called the election for Clinton with less than 1% of the vote counted and thousands of people waiting in line to vote. Four hours after polling stations closed, hundreds of people were still waiting in line: 37% (1.219 million) of registered voters declared as independents; 34% (1.115 million) as Republicans; and 28% (932,722) as Democrats. Sanders has won a vast majority of independents in every state. Bomb threats prevented many voters from getting the help they needed: Two hours after polls closed in Arizona, officials there had counted only 54,000 of the estimated 431,000 (12% of Election Day ballots. Sanders has done much better in caucuses than in primaries. He has won just 4 of 21 primaries with a 41% share but has won 11 of 12 caucuses with a 66% share. There is a 97.8% probability that the difference was not due to chance.View the graph. The Utah primary: This is what a fair election looks like: Note the parallel lines representing Sanders and Clinton vote shares. Late changes to the MA Democratic Primary exit poll indicate that the election was likely stolen. As always, the exit poll was adjusted to match the recorded vote. Sanders led the Unadjusted MA Exit Poll Gender crosstab (1297 respondents) by 52.3-45.7%. The poll was captured from CNN at 8:01pm . Clinton led the adjusted exit poll (1406 respondents) by 50.3-48.7%, a near-exact match to the 1.4% RECORDED vote margin. But her 50.3% share was IMPOSSIBLE. The proof is self-explanatory: How could Clinton gain 114 respondents and Sanders just 7 among the final 109 exit poll respondents? Clinton won by 51-49% on electronic voting machines from ES&S, Diebold and Dominion. Sanders won 68 hand-counted precincts by 58-41%. He won 250 of 351 jurisdictions and had at least 58% in 110. Recent Massachusetts elections are highly suspect and show similar anomalies. The True Vote and Registered Voter Turnout models and CVS analysis indicate to a near 100% probability that the 2014 MA Governor election was stolen from Coakley (D). In the special 2010 senate election for Sen. Kennedy’s seat, Coakley won the 71 hand-counted precincts with 51.1% of the vote (32,247) to Brown’s 47.8% (30,136). Massachusetts has 71 hand count locations, 91 ES&S and 187 Diebold locations. The American Association for Public Opinion Research (AAPOR) discusses the matching process in Explaining Exit Polls. But they never mention election fraud as a likely cause of the discrepancies. In actuality the adjusted exit poll crosstabs contaminate the true statistical results and are misleading as they do not reflect the the actual responses of those exit polled. ” In close races, the projection models also employ actual vote totals, first in sample precincts as it becomes available and then at the county level for all counties in a state as they become available. It is important to note that after the votes have been counted, the exit poll results are adjusted to match the actual election outcomes. It is in this way that the final exit poll data can be used for its primary and most important purpose – to shed light on why the election turned out the way it did”. Exit pollsters at Edison Research should not be making adjustments. But it is standard operating procedure. Why? It is unscientific and hides the actual exit poll results. It serves to cover-up the fraud which is measured by the recorded vote discrepancy (view the 2004 and 2008 National Exit Polls below). Ted Soares provided the following Exit Poll vs. Reported vote table on the Election Integrity Forum. Discrepancies in eight of nine exit polls favored Clinton in the reported vote. The average margin discrepancy was 8.5%, The 4.25% vote share discrepancy is far beyond the 9-poll margin of error (approximately 2%). The diverging lines confirm the unadjusted exit poll and indicate fraud. Clinton’s cumulative vote share increases going from small to large towns. The vote shares should be nearly constant. At the 10% CVS mark, Sanders had 57%. He had 54% at the 25% mark. View the Town Precinct vote data. In 2004 Kerry led the National Exit poll by 51-48% after the first 13047 respondents, but Bush had 50.8-48.3% (the recorded vote) at 13,660 respondents. When the unadjusted exit poll became available years later, it showed that Kerry won the 13,660 by 51.7-47.0%. The pollsters had to switch 471 (6.7%) of Kerry’s 7,064 responders to Bush in order to match the recorded vote. Kerry had 51% at 4pm (8,349 respondents). His exit poll share increased to 51.7% at the final 13,660. In 2008 Obama had 61% in the unadjusted National Exit Poll (17,836 respondents), but just a 52.9% recorded share. The pollsters had to reduce Obama’s respondents from 10873 to 9430 (13.3%) in order to force a match to his 52.9% recorded vote. Unadjusted 2008 National Exit Poll … Margin of error: 0.93%. This is a follow-up to KY 2015 Governor Cumulative Vote Shares indicate Likely Fraud. Bevin(R) defeated Conway (D) by 52.5-43.8%, an 85,000 vote margin. Pre-election polls had Conway winning by 3-5%. Conway’s cumulative vote share declined from the 25% mark to the final in 75 of the 109 counties for which there is precinct data. The probability of this occurrence is 1 in 26,000. His vote share declined from the 10% mark to the final in each of the 17 largest counties. The probability is 1 in 262,000. We would normally expect a nearly even split of gains and losses. – 10% CVS mark, Conway won by 49.5-46.4%. County vote data was categorized into groups from the largest 15 counties to the 120 total. Conway had 56.4% of the Top 15 at the 10% CVS mark and 53.9% at the 25% mark. – registered voters: 0.32 correlation at 25% CVS and 0.25 at final. – ballots cast: 0.32 at 25% CVS and 0.27 at final. – voter turnout: 0.20 at 25% CVS and 0.22 at final. In the six small counties chosen for an audit (54,000 votes), Conway had 42.1% at the 25% mark and 39.3% at the final. A better choice would have been six large counties (352,000 votes) i which Conway had 60.2% at 25% and 52.9% at the final. A Sensitivity Analysis over a range of vote shares and returning voters from the 2012 presidential election indicated that Conway won the base case scenario by 49.9-46.8% with a 98% win probability, matching the pre-election polls. He won 64 of 75 scenarios. Secretary of State Lundergan (D) won with 51.16%. In 17 counties for which there is absentee voter data, Conway had 45.4% in absentee paper ballots (984) vs. 32.6% in total ballots (65,915). His vote share in absentee paper ballots exceeded his total vote share in all 17 counties. He had 37.3% in machine absentees. In the KY 2015 Governor election, Matt BEVIN (R) defeated Jack CONWAY (D) 52.5-43.8%, an 84,000 vote margin. Conway was leading in virtually all pre-election polls by 3 to 5 points yet he had fewer votes than other Democrats on the ticket. In Kentucky, registered Democrats led Republicans by 53.4-38.8%. Click to view the KY True Vote Model. The objective of CVS analysis is to view the effects of county/precinct size on the cumulative vote share trend. Since the largest counties are usually heavily Democratic, the consistent pattern of Republican Governor candidates gaining share from small to large precincts is counter-intuitive. On the other hand, there is virtually no change in vote shares in smaller, heavily GOP counties. This defies political reality and the Law of Large Numbers. The analysis indicates that the pre-election polls were likely correct and that Conway probably won the election. CVS analysis of the 2014 FL, IL, WI, MA and MD Governor elections exhibited the same anomaly: a counter-intuitive rise in GOP cumulative vote shares in larger counties. But the KY analysis indicates that the anomaly occurred in many smaller counties. The Summary sheet displays recorded final vote shares and cumulative shares for 120 counties at the 10% and 25% CVS mark. For example, in a county with 20,000 votes, the 25% CVS mark represents the first 5000 cumulative votes, starting from the smallest precinct. – 10% CVS mark, Conway won by 49.5-46.2%. – 25% CVS mark, Bevin won by 48.3-47.7%. As in previous CVS analysis, it appears that votes were stolen in Democratic strongholds. In the 25 counties in which he was leading at the 25% mark, Conway’s 11.6% margin declined to 1.5%. In the other 95 counties, Conway’s -23.3% deficit declined just 1.9% to -25.2%. Conway’s cumulative vote share declined from the 25% mark to the final in 53 of the TOP 60 counties, a 1 in 3 million probability! In a random process, we would expect a nearly even split. The probability is overwhelming evidence that there is an external fraud factor in the vote tabulation. Another statistic of interest: a strong 0.33 Correlation between county vote size and Conway’s vote share margin. The 120 counties were sorted from largest to smallest to calculate the change in cumulative vote shares from the 25% mark. Conway’s share fell 5.6% from 53.9 to 48.3 in the TOP 15 counties; declined by 2.0% from 40.8 to 38.8 in the other 105 counties.This is a clear indication that votes were flipped in the largest counties. For example, view the Bath County spreadsheet. Conway’s vote share increased from 47.1% at the 25% mark to 49.9% at the final. Bev Harris of BlackBoxVoting.org noted that the higher Democratic vote totals in the down ballot races were a “significant anomaly”. Bevin (R) won the total recorded vote by 52.5-43.8%. Lundergan (D) won the Secretary of State by 51.16-48.84%. Bevin won the Top 25 counties by 49.3-47.0%. Dem SOS candidate Lundergan won the Top 25 by 53.3-46.7%. Confirming CVS at 10%, Conway wins by 50.1-46.2% if we add the 6.3% difference in Lundergan’s Top 25 share to Conway’s total 43.8% share. This sheet shows two-party vote shares for Governor, Attorney General and Secretary of State in the largest 25 counties. The True Vote Model displays various scenarios of returning Obama and Romney voters along with corresponding vote shares. The model uses two returning voter estimates based on Obama’s 2012 recorded KY vote and his True Vote. The model matched the 2015 recorded vote assuming Obama’s recorded KY 2012 vote. It matches the CVS vote shares at the 10% mark assuming Obama’s True Vote. The Sensitivity analysis tables display Conway’s total vote shares and margins over a range of returning voter turnout and vote share scenarios of returning and new voters. The cumulative vote share at the 25% mark is the baseline for estimating the True Vote. But we may want to view changes in vote share in the 0-25% range if we assume that votes were also flipped in the smallest precincts. The 10% mark is also used as an estimate of the True Vote. Conway led by 50.6-45.2% at the 10% mark. Conway led by 48.6-47.3% at the 25% mark. Bevin won the recorded vote in the TOP 80 by 51.9-44.4%. Conway led by 51.4-44.3% at the 10% mark. Conway led by 49.5-46.4% at the 25% mark. Bevin won the recorded vote in the TOP 60 by 51.2-45.1%. Conway led by 50.9-44.9% at the 25% mark. At the final, Bevin led 50.2-46.1%, a 10.1% reduction in Conway’s margin. Assuming Conway had 113,000 (47%) of the remaining 239,000 votes in the other 80 counties. he would win by 50-46%. Conway led by 51.9-43.9% at the 25% mark. At the final, Bevin led 49.3-47.0%, a 10.3% reduction in Conway’s margin. Conway led by 53.9-41.9% at the 25% mark. At the final, Conway led the Top 15 by 48.3-47.9%, a 11.7% reduction in Conway’s margin. Given Conway’s 53.9% vote share in the Top 15 counties at the 25% mark, Bevin needed 305,000 (67%) of 455,000 votes in the other 105 counties to match his recorded vote margin (52.5-43.8%). He had 263,000 votes in the 105 counties. Given the anomalies in the TOP 15 counties, it is safe to assume that he had less than 263,000 votes. Conway had 40% of the recorded vote in the Bottom 60 counties, but we do not have the CVS for the group. Since we have CVS estimates for the TOP 60, we calculate estimates of Conway’s total vote using a range of vote share estimates for the Bottom 60. 1) formula, 2) 10% CVS, 3) 25% CVS. He won 12 of the 15 scenarios. Conway ties Bevin with 40% (the break-even share) in the smallest 60 counties. – 51.5% of the TOP 60, he wins by 49.9-46.1% (36,800 votes). – 49.5% of the TOP 60, he wins by 48.2-47.8% (4,700 votes). – 51.5% of the TOP 60, he wins by 50.2-45.8% (42,600 votes). – 49.5% of the TOP 60, he wins by 48.5-47.5% (10,500 votes). Compare the recorded vote shares in the following county subgroups to the cumulative shares at the 25% mark. Conway leads Bevin in all groups from the Top 15 (53% of the total vote) to the Top 80 (92% of the total). A Democratic stronghold, Jefferson is the largest county in KY with 192,391 recorded votes. At the 25% mark (48,000) votes, Conway led in Jefferson by 66-30%. He won the county by 58-39%. The 17% change in margin lowered his vote margin from 69,000 to 31,000. But there may have been vote flipping from zero to 48,000. Conway led by 70-27% after the first 11,500 votes. There were 69,953 recorded votes. At the 25% mark, Conway led by 60-34%. He won the county by 55-40%. The 11% change lowered his margin from 18,000 to 10,000 votes. There were 31,453 recorded votes. At the 25% mark, they were tied at 47%. Bevin won the county by 57-39%. The 18% change increased Bevins’ margin from 80 to 5700 votes. Conway led by 53-41% after the first 2,200 votes (7% mark). Cumulative Vote Shares were calculated for the following 2014 elections. All exhibited the same counter-intuitive rise in GOP cumulative vote shares. McConnell (R) defeated Grimes (D) by 56.2-40.7%, a 222,000 vote margin. In Jefferson County, Grimes had 56.1% and won by 35,000 votes Grimes’ vote share was 67.5% at the 10% CVS mark and 64.9% at 25%. But Grimes had just 53.3% from 25% to the final – an 11.6% decline. Assuming Grimes had a 64.9% True Vote, she would have won Jefferson County by 80,000 votes. Conway had 66.0% at the 25% mark and ended with 58.2%, a 7.8% decline. Grimes had 64.9% and ended with 56.1%, an 8.8% decline. A statistical study by G.F. Elections, reveals a correlation of large precincts and increased fraction of Republican votes. Francois Choquette and James Johnson exposed anomalies in the 2012 primaries. Mathematician Kathy Dopp has written a comprehensive essay on the 2014 elections. She is an expert on election audits. Compare the 2014 Senate race to the 2015 Governor contest.